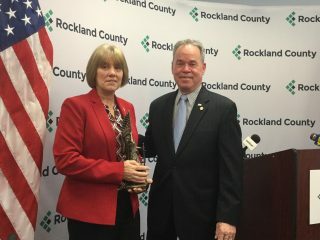 PRESS RELEASE– Rockland County Executive Ed Day marked the start of Women’s History month and his new Women’s Initiative today by naming Senior Chief Mary E. Cavanagh the Rockland Female Veteran of the Year. “We are proud to highlight the achievements that women have made in building our nation and, in this case, defending it,” the County Executive said during a ceremony announcing the honor. Senior Chief Cavanagh grew up in Garnerville and graduated from North Rockland High School before beginning a long and distinguished career with the Navy. She is now director of the North Rockland High School Junior Navy ROTC. “She served our country with distinction and honor in the Navy, broke gender barriers and now serves as a role model for young people – male and female – in Rockland,” Day said. Senior Chief Cavanagh trained as a cryptologic technician. Her service brought her to Florida, Spain, the Mediterranean, Guam and back to Washington, D.C., where her final assignment was with the National Military Joint Intelligence Center at the Pentagon. Along the way she achieved many firsts. In 1982, she was with the first contingent of women to be permanently assigned to the Naval Support facility Diego Garcia in the Indian Ocean. Senior Chief Cavanagh earned many medals and citations for her service: the Defense Meritorious Service Medal, the Joint Service Commendation Medal, the Joint Service Achievement Medal, the Navy Achievement Medal with three gold stars, the Good Conduct Award with four bronze stars, Expert Rifle, Expert Pistol and various other campaign medals and ribbons. She is also authorized to wear the Joint Chiefs of Staff Badge and the Enlisted Aviation Warfare Specialist Insignia. Through Senior Chief Cavanagh’s efforts, the North Rockland Navy Junior ROTC has performed over 40, 000 hours of service to the community as well as over 28,000 hours of school support. She has been instrumental in fostering a connection between the North Rockland school district and the Rockland veteran community. Under her leadership, the North Rockland ROTC won the Distinguished Unit with Academic Honors in 2015 – only 11 of 56 units in the Northeast region received this honor. She also teaches ROTC cadets at the Naval Leadership and Sail Training Academy in Newport, Rhode Island.